eL Seed was a Makers Muse recipient in 2011 and since then he’s become a close friend of ours. Over the past two years we have watched him accomplish striking artistic, social, and political feats in his home country of Tunisia. Our connection with eL Seed has afforded us the privilege of hearing his first hand accounts of his journeys back to Tunisia, including the challenges, the joys, and the community that naturally builds around him as he involves locals across generations, genders, and walks of life in his work. In the past year, eL Seed has been back to Tunisia twice. For his first trip he traveled to Kairouan where he was commissioned to paint a wall in the center of the city. His mural there sparked not only the beginnings of a renewed focus on art and culture in this ancient city, but also brought attention to the importance of street art in post-revolution Tunisia. This multi-layered outcome was in large part why we chose to fund this project in 2011. Tunisia’s street art scene is still developing and morphing as the cultural and artistic milieu of the country is continuing to be built up. In pioneering spirit, eL Seed returned this summer to his home town of Gabes, Tunisia, to paint a mural on the minaret of the Jara Mosque. The beautifully shot video, below, had thousands of hits within it’s first week. I caught up with eL Seed over the phone last week to hear about his experience in Gabes. Our conversation spanned issues from religion to logistics, and as often happens when talking with eL Seed, I always learn more about the precise intention and intelligence of this revolutionary artist. Kindle Project: Everybody wants a piece of eL Seed! eL Seed: I’ve been wanting to do an interview with Kindle because you all were one of the first to support me. KP: We’ll do it now! But we get it, we’re no Guardian or Al Jazeera, you gotta answer the big guys first. ES: Do we make it like I don’t know you? KP: No, we make it like we know each other. The thing with Kindle is that because we’re close with our grantees it’s a more relaxed interview. We can have a real conversation. I like it more this way. ES: I did an interview today with BBC radio which was cool… but I consider this more like a conversation. KP: Me too. When I was reading through the interviews you’ve done recently I was wondering what you wished people would ask you. ES: You know, people ask me the same questions all the time. How I started doing graffiti and etc. KP: I was thinking about what you do, and how unique it is. I was reading the interview you did in Art Slant this morning and you spoke about the real problems of Tunisia, but it doesn’t seem like you’re ever given the opportunity to expand on it. Is there anything else you’d like to add about having just come home from Tunisia? 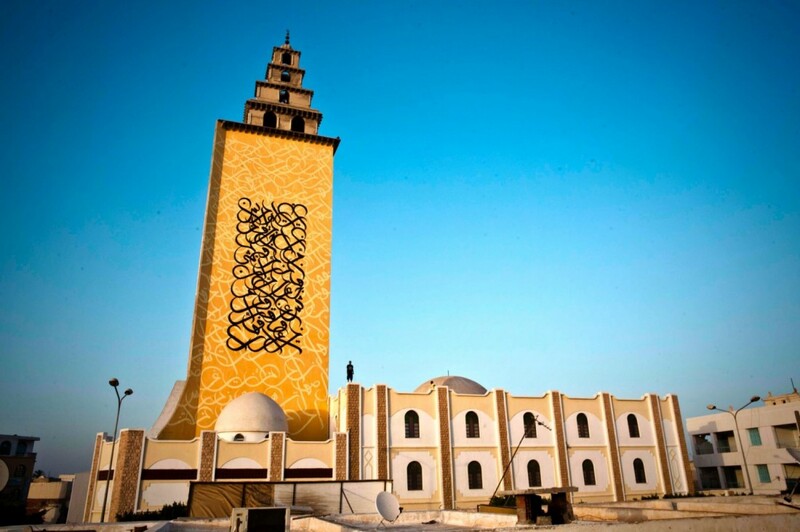 Also, I didn’t realize that this was the first time in the Middle East that any graffiti or Calligraffiti had been done on a mosque, I’m wondering what the response was like and what that means for Tunisia right now? ES: The funny thing is, I don’t know if you heard about what happened in Tunisia in May with the Printemps des Arts. I don’t want to judge any artists, but I feel like most of the artists there just wanted to provoke people. They knew that if they do something special that they will bring attention to themselves. For example, some people did a caricature of the prophet on a donkey and etc. but some people did not react well to that. It’s stuff that’s easy to play with. But, I don’t know. As an artist I don’t think that’s where we should be pointing today. I think we need to focus more on the economic and political situation. Some religious extremists react very strongly and then the media brings a lot of attention to these projects. Others start talking about freedom of expression, and what happened at Primtemps des Arts is that so many artists had the same idea, to speak about Islam in a bad way. KP: To criticize Islam in order to provoke extremists? ES: Ya! So they [the extremists] came and broke some artwork and for me, both sides of this are really pathetic. KP: It reminds me of when we first met and you told me about the evolution of using your name in your work to not including your name at all. It’s a different kind of humility that you express in your work. It can speak to a lot of people regardless of whether they know who you are or not. A piece by eL Seed in Los Angeles. ES: Yes, exactly. Then, what happened after that, the people who commissioned me for my work in Kairouan asked me to come back and paint another wall. I said ok, but only if it was in my city of Gabes. We were looking for a wall, and we found the wall of this mosque which had never been painted. We made this decision right before the Printemps des Arts and then after that we realized it was the perfect time to do it. Because the point was to show Tunisia the two points of extremism: secular extremism and the religious extremism. Both of them agree on one point, that there’s no innovation or creativity or artistic expression in Islam. KP: Do you see yourself as a middle point between these two extremes? ES: Yes. I am an artist. I am Muslim. I painted graffiti on a mosque. Actually, when you speak about all of this it sounds so opposing. Graffiti and mosque. Artist and Muslim. In Tunisia if you are an artist you’re considered to be a bohemian who is smoking and neglecting himself. KP: Is this some romanticized idea of what an artist is? Some kind of French, bohemia, turn-of-the-century kind of identity? KP: Aside from you, are there other artists that don’t fit this mold that are responding to what you’re doing? ES: I met some friends who are really responding to what I’m doing, but the bad thing is that some of my friends are the artists who did some work in Printemps des Arts. They were seeking the spotlight in a way. KP: Is it hard to have a spotlight on your work in Tunisia? 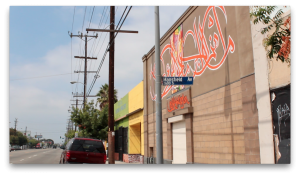 The minaret project came right after the Printemps des Arts, which was perfect timing because we could show there’s no opposition between being an artist and being Muslim, and between graffiti/Calligraffiti and a mosque. You know, there’s so many seemingly opposing things that I try to bring together. The funny thing is, that because it worked and everybody liked it in Tunisia, we got no media attention in Tunisia. KP: Because people from both extremes were responding positively there was no need for the media to cover it because everybody was having a nice experience? ES: Yes. There were more than ten papers that covered this piece but none of them were Tunisian…Even our good newspaper didn’t want to show it. If I had some people who were resisting the project and being violent towards me, the papers would have been there. KP: But you had no resistance? ES: No! Everybody liked it. KP: You are so many things: you’re an artist, you’re a Muslim, you’re a father, and you live in many places. When you’re in Canada and when you’re in France do you have this same contradictory sense or is it just when you’re in Tunisia? ES: I feel it everywhere. In France, I feel it more and more, because it’s different. They don’t accept you the way you are. 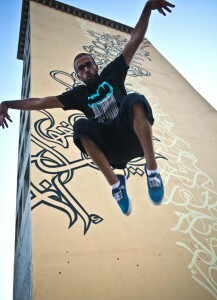 It’s hard to say, “I’m an artist, I do graffiti, I paint in Arabic.” Doing graffiti in Arabic in France is really bad. KP: Is this because of the anti-religion sentiment happening there? ES: Yes, it’s anti-Arab, anti-Muslim and I felt it. If you check out my website you can read the Open Your Heart story there that describes a lot of this. I thought I was going to paint in Paris, and I was cleared by the Mayor, but then I wasn’t allowed to because it was going to be in Arabic script. That was really hard. KP: And what about in Canada? ES: It depends on if you’re in the French part. KP: Right, because in Montreal you have a lot of French-speaking Arabs. ES: Ya, but I don’t really paint here. I feel like people here are a lot like people in France. If they see Arabic writing they will feel fear. KP: What about Arab Winter? Did that help at all? ES: No. I mean, Arab Winter was really cool, but we didn’t have a lot of media exposure. We had one interview on CBC, that’s it. But we did have a very mixed crowd coming out. KP: The thing that happens in Montreal is something similar to what happens in France, which is that if anyone presents themselves as religious at all and contemporary it’s a challenge too for that person to be a part of secular artistic practice. It’s a challenging for how we perceive artistic identity. ES: But, I don’t even present myself as a Muslim artist. I wrote Qur’an on the mosque because it was a mosque but I have no interest in converting people to Islam. The verse on the mosque speaks to all humankind. KP: That’s what I loved about this project. You could have chosen any passage from the Qur’an that could have inspired the community, but you made it a very universal experience. ES: That was the point for me. To show that Islam is universal, in a way. It was also to share a message of peace. KP: I also feel the text you chose to paint is one that is very relatable and present in other faiths as well. ES: It’s my hope to bring more dialogue in Tunisia. That was the point of it. KP: What’s next for you? ES: I have a solo show in Paris and then I’m off to Melbourne. I’ll be painting at a festival in Melbourne. I’m also shooting my first short movie. I won’t tell you anything about it, but I think it will make you smile. I’ll tell you one thing. It’s the story of a postman. KP: Ok, we’ll be waiting! eL Seed’s work in Gabes, supported by the Barjeel Art Foundation, has been covered by a number of news sources: CNN, The Guardian, Al Jazeera, and Art Slant to name a few. While we always love reading his interviews, it’s an extra pleasure to get to speak with him ourselves. He is, as he described, an apparent contradiction. At once fiercely confident about his work and his capacities, and also entirely humble and earnest. It’s easy to admire and support eL Seed: he’s collaborative, creative, inventive, and is perpetually pushing the boundaries. In cities around the world, he makes people question what street art is, and what graffiti is capable of.